Imagine yourself playing Flappy Bird. You're on a roll, clearing pipe after pipe, and moments before you're about to beat your record of 26, your smartphone rings and minimizes the game. Anyone would get at least a bit frustrated if that happened to them, don't you think? Thankfully, there's Call PopOut. 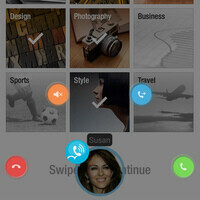 Call PopOut is an app that replaces an Android phone's incoming call screen. All that appears when the phone rings is a circle with the picture of the caller in it – the active app continues to run. Then the call can be easily muted or rejected with a swipe to the side – very handy for situations like the one described above, or any other in which the user wouldn't like their app to get sent to the background. What's even better, Call PopOut is a free application, and if you're bothered by the ads, you may go Pro for a buck. This will also unlock a handful of premium features, including the option to modify the pop-up circle's size and position. And that's Call PopOut, in a nutshell. Follow the download link below to get it on your Android smartphone. wow nice feature, the power of android! What happens if you take the call? does it still stay minimized? for me its annoying when i'm using the GPS (google maps). If i take a call then the maps gets minimized. I want there to be a way that I can take a call but have my maps application stay upfront. The galaxy s5 does that already. LG G2 and G Flex won't close apps either after 4.4.2 upgrade.